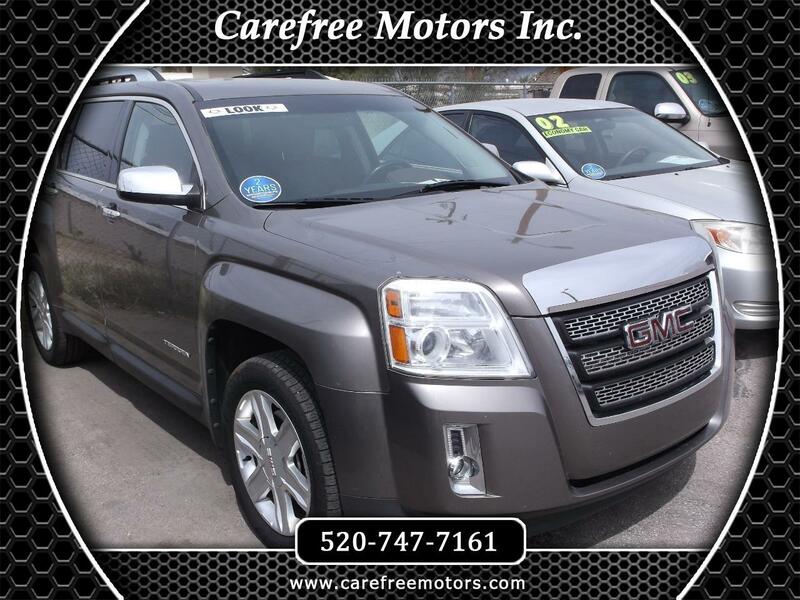 Used 2011 GMC Terrain SLT2 AWD for Sale in Tucson AZ 85710 Carefree Motors Inc.
SWEET DEAL! 2011 GMC TERRAIN SLT, SUV 4 Door, V6, Flex Fuel, 3.0 Liter, Automatic, 6-Spd W/Overdrive, All Wheel Drive, Traction Control, StabiliTrak, ABS (4-Wheel), Key less Entry, Key less Start, Air Conditioning, Power Windows, Power Door Locks, Cruise Control, Power Steering, Tilt & Telescoping Wheel, AM/FM Stereo, CD/MP3 (Single Disc), Premium Sound, XM Satellite, Bluetooth Wireless, On Star, Parking Sensors, Backup Camera, Dual Air Bags, Side Air Bags, F&R Head Curtain Air Bags, Heated Seats, Power Seat, Leather, Moon Roof, Daytime Running Lights, Fog Lights, Roof Rack, Alloy Wheels, Fuel City/Hwy 16/22 MPG. 163,639 Original Actual Miles. FREE 2 YEARS LUBE OIL AND FILTER CHANGES!